I recently started home schooling one of our granddaughters and it has been a wonderful experience. We are using the public school curriculum K12 and while some would not consider that home schooling, I still do. There are so many opportunities for conversation and input of our own personal views. I would not want to miss it for anything. Saarah and I are having some very special times together and I treasure every minute of it. We are doing it for one year. Her Mom and Dad are wanting to move within the next year and did not want to submit her to the trauma of changing schools. So for one year I have this very special time with her and I will treasure every minute of it. And, of course, I will have to make some designs to show my enthusiasm for home teaching. You knew that, didn’t you? I am letting you have a little peak into what’s coming up. 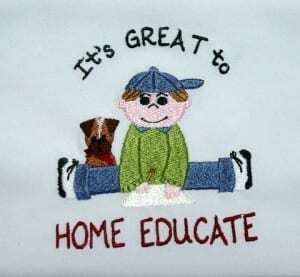 Are there any other home schoolers out there? I hope so because I am having a lot of fun making these designs. Well, I just wanted to share what’s taking up half of my day these days. So my digitizing might slow down some, but it’s well worth it to me. Keep checking my site – you never know. I don’t sleep so well at night anymore and there are nights when I digitize just to “calm down” and be able to go back to sleep. Don’t forget to join my yahoo group. The free designs there will be taken down after a while and replaced with new ones. Some of those designs will be put up for sale later on. Found your blog through swak! Love your homeschooling stitch outs. These are the first I have ever seen. We are not really a homeschooling family right now. I am teaching in a Montessori School with my daughter in my class and my son in the same building. We miss homeschooling although we love what we have. We do home school some evenings and on the weekends. Last few weekends have been really busy with less classroom time and TONIGHT my son, 7, asked can we home school this weekend, I want to learn more! Awe… I agree you have a great opportunity with the public school. It is not that different than using any other prepackaged program! Go for it, love it and LEARN from it!